When preparing to go on a beach vacation, most of us swear we will exercise every day at the resort’s gym. Having the best intentions, we pack our workout clothes, but in all honesty, do we really want to go to the gym on vacation? Isn’t the point to take a break from real life? A vacation can be the perfect time to exercise – a different way. Discover new ways to have fun and keep your body fit at the same time! 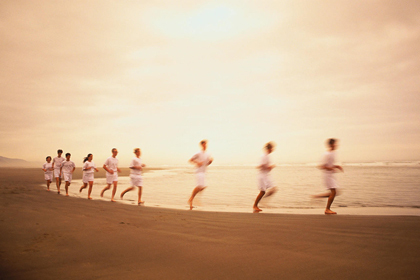 Walking or running in soft sand is a great workout and actually burns more calories than on flat ground. Some experts suggest that you can burn twice as many calories walking in soft sand. So put on your running shoes in the morning and take as little as 20 minutes a day: you’ll be surprised how hard it is. 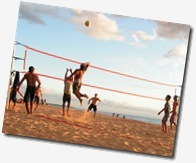 You can burn up to 150 calories an hour playing volleyball, depending on how much effort you put into it. Plus, it’s a great way to meet other people at the beach, get a great tan, and have fun. Surfing is a total body workout that will challenge every muscle in your body. Even if you ‘re a newbie and you have no idea what you’re doing, you’ll get a great workout anyway. Snorkeling is a bit more leisurely, but you can add intensity by swimming faster or taking a few laps. Long bike rides are a great way to see the area while getting in some low-intensity exercise. If you take your time and ride all day, you’ll burn calories without even thinking about it. Anytime you add elevation to your walks, you’ll burn more calories. If you carry a backpack, you’ll challenge yourself even more, all while enjoying nature. Yoga can make us feel absolutely fantastic both in body and mind. 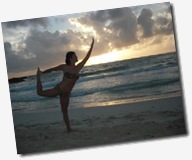 What’s more relaxing than working out, stretching out your muscles in front of a beautiful beach at sunset? Best of all, yoga gets your blood flowing and gives you that “flushed” look after a workout. Jogging is a great, efficient workout and can be done anywhere. It’s a great way to get to know the area and run at the same time. 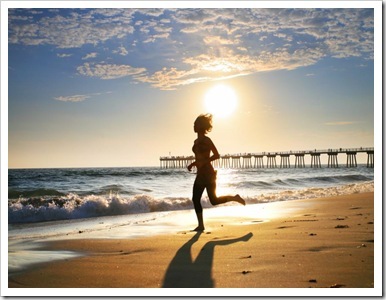 We recommend running in the Cancun hotel zone, since there is a long pathway for biking, running or rollerblading. 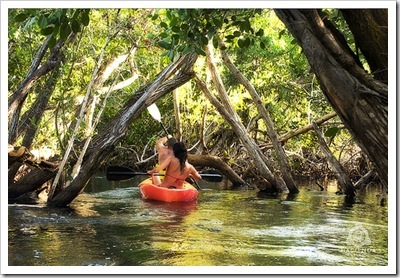 Cancun is a great place to go kayaking, since there are many cenotes, rivers and beaches. Kayaking provides a great upper-body workout and will make you surprisingly tired after an hour. To make it more fun, rent kayaks and race with friends. To make it even more challenging, have someone ride the same kayak , which adds more weight.